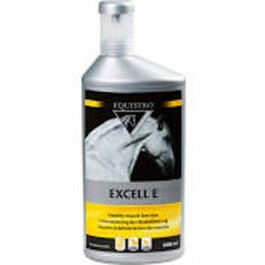 Equistro Excell E is a dietetic feed supplement formulated specifically to support and maintain healthy muscle function and integrity in horses. What is Equistro Excell E? Equistro Excell E is a dietetic feed supplement formulated specifically support and maintain healthy muscle function and integrity. It is particularly recommended for assisting horses following an increased demand relating to muscular exertion and tension. The formula contains a blend of Magnesium, L-lysine, Vitamin-E and organic Selenium. Vitamin-E and organic Selenium, helping to protect the muscle cell walls. Magnesium helps to improve the use of cellular energy and help increase the quality of muscular relaxation, whilst L-lysine aids in the restoration of damaged muscle fibres. Once a year, Equistro Excell E batch is analysed for environmental contaminant, ensuring that the product doesn’t contain ingredients likely to make a positive doping test. What are the benefits of using Equistro Excell E? What is in Equistro Excell E? Magnesium chloride 17%, Glycerin. Additives/Kg: Composed of trace elements: Selenium (organic derived from Saccharomyces cerevisiae CNCM I-3060 – selenium inactivated yeast) (E3b8.10) 23 mg. Amino acids and salts: L-Lysine (monohydrochloride) (3.2.3.) 89 720 mg. Vitamins and pro-vitamins: Vitamin E/all-rac-alpha-tocopheryl acetate (3a700) 105 140 IU. How do I use Equistro Excell E? Horses (500 kg): Athletic horses or horses subject to muscle stiffness 20 ml per day. Leisure horses 10 ml per day. Light horses/ ponies: Decrease the amount by half. Is there any further advice I should know about Equistro Excell E? Due to presence of trace elements with maximum set limits, administration must not exceed 150 ml/ 500 kg horse/ day. Equistro Mega Base is a complementary feed supplement that helps cover the basic needs in vitamins & minerals for all horses, particularly those fed on rations rich in cereals.